Is it Possible? Even Our Porcelain Brushes are Superior Dental Lab Products! We are known to excel in our dental lab polishing products – many people know that our polishing products take less time and effort to get a better result – but it may not be well known that our porcelain brushes are also superior. Being in a position to introduce product that virtually takes a technique to another level is very exciting. That is exactly what the STAR BRUSH Line does! They provide a level of performance with regard to the tip integrity, moisture management, porcelain manipulation, and durability far beyond any other brush on the market. ability of brushes to display these features. 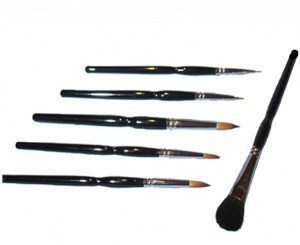 In general, the more expensive brushes, supposedly manufactured in Germany have grown to be accepted as the standard. However, those customers having tried DVA’s new “STAR BRUSHES” report they excel in all areas of performance! Hence, we enter the market with a great opportunity, always keeping in mind, the acceptance of any dental product, and brushes would certainly be included, is a very personal decision. We probably cannot please everyone, but we certainly can please most! 2. Natural (Produced from the hair fibers of animals) The ‘natural’ brushes have evolved into the acceptance of two general classifications of brushes – Red Sable and Kolinsky Sable. Red Sable brushes, so referred to because of their ‘reddish-brown color,’ are produced from the weasel animal; while the Kolinsky brush is made from a mink (also of the weasel family) that is native to Siberia and northeastern China, where the extremely cold weather causes the development of a thick, long coat of hair. Only hairs from the tail of these animals are used in making dental brushes. It is IMPORTANT TO NOTE that while the KOLINSKY brushes are, in general, more expensive, the acceptance of any ceramic brush is a function of its performance as perceived by the individual using it! DVA offers those brushes as perceived as the ‘most critical’ with respect t building porcelain in the highest quality of Kolinsky fibers available. Most importantly, the source of the fibers for our manufacturer, based upon their generations of involvement with the manufacturing of fine brushes, is consistent. There is one other brush that is included in our line – a rather large brush, shaped in a thick, somewhat ‘shovel-like shape” that is used to ‘withdraw’ moisture from the porcelain prior to placement into the firing oven. This brush is used in a ‘whipping motion’ to cause any moisture to come to the surface and be ‘whipped away.’ This action also condenses or packs the porcelain to some degree. Again, reports from our testing customers have indicated this particular DVA brush, made from the hairs of the GRAY SQUIRREL, is much more effective and works faster than the brushes previously available. It seems to be somewhat firmer and thicker than the competitive brushes. It is fast, quick and effective! It is very important to note that while many, many different brushes are on the market, DVA’s focus must not be on competitive brushes, but rather the PERFORMANCE of our “STAR LINE!” They just do what porcelain brushes should do – “They Perform,” and they do so like STARS, and they are PRICED COMPETITIVELY! THAT is what we need to sell! Just provide the customer with ASSURANCE, ASSURANCE, ASSURANCE that they are going to be happy with DVA’s STAR brushes. Dental Ventures will offer a broad line of brushes to meet all of the demands of the ceramist. We will NOT offer every size, but we will offer a variety that seems to fulfill the needs of most technicians. We will offer sizes 00/0/6 in RED SABLE, and the numbers 8 and 10 in the Kolinsky style. DVA’S “Jerry’s WOW Solution” consists of a silicone-based liquid packaged in a 16-ounce bottle designed for use as a gypsum-to-gypsum separator. The product is characterized by its lack of odor, incredibly clean separation capabilities and economical price. Jerry’s “WOW Solution” derives its name from its outstanding performance and economy. Nothing separates gypsum like “WOW Solution.” It’s just a “WOW” product! 1 . Acrylic Separators – designed as a tin-foil substitute. Tin foil was the original separator medium used to separate denture acrylic from the stone model during polymerization procedures. Many companies now sell a separator for this procedure. DVA’s “Acrylic-Plaster Separator” (“APS”) represents a separator of this class. 2 . Crown and Bridge Separators – designed to separate wax patterns or porcelain margins from stone models. DVA’s “Very Special Separator” is a separator of this class. i. They are used to separate halves of a denture flask. Vaseline (as well as other competitive products) has also been used extensively for this procedure. ii. For the mounting of articulating plaster to full or partial denture models for use during the setting up of teeth during the fabrication of the wax pattern. Again, Vaseline and other products have been used for this operation. is also, compared to DVA’s new product, rather expensive. DVA offers twice the volume at virtually half the price. As successful in the marketplace as it is, we do NOT believe ‘Super-Sep’ is as effective in its separation ability as DVA’s WOW Solution! Need we say more! Totally Eliminates Odors from the working environment – it is totally odorless! Eliminates the need to re-soak dry models prior to making second pours.